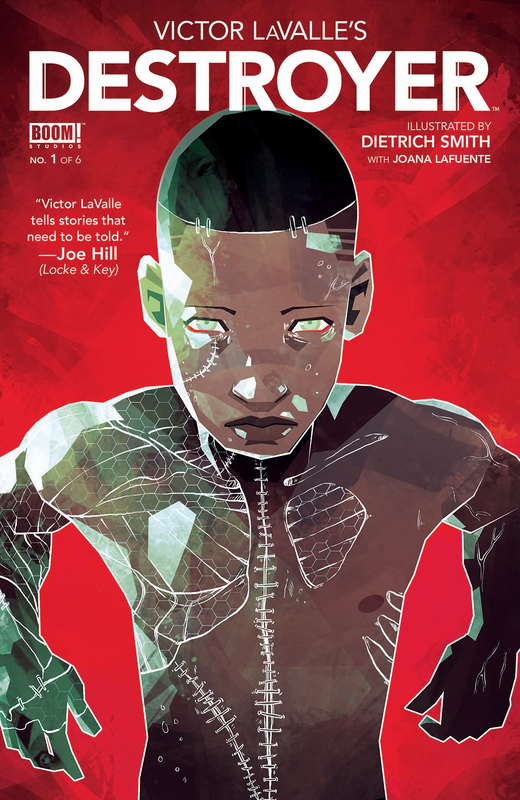 Victor LaValle's Destroyer #1 Review – AiPT! Going into Victor LaValle’s Destroyer #1 completely blind (is there any better way? ), I wasn’t sure what I was experiencing when picking this comic book up. At first I thought it was a monster tale, then one about protecting animals, and then further on a tale of vengeance. It’s all of these things, which is partly why it’s so interesting. So what’s it about? Read the preview! The writer of this comic comes from the world of writing books, which should instantly bring your attention to this work. Typically writers of novels and short stories have a knack for telling comic books, because they’re so damn good at capturing character wrinkles in efficient and interesting ways. Their dialogue is usually great too. Plus he’s a Hugo award winning author. Need I say more? I always approach comic books with the understanding they should be works that fall somewhere in between the film and novel experiences, respectively; they’re incredibly visual, but still on the page. After a page or so I got the sense this comic is a touch closer to cinematic than most. We’re instantly introduced to Frankenstein’s monster, living in Antarctica as the novel ended, and basically chilling out. Whalers show up and they seriously tick him off. Victor LaValle progresses things quickly and efficiently to the point where characters you may have thought would stick around are gone in a flash. It’s a whirlwind of an issue, much like the opening of a movie, which leaves you with a lot to chew on and even more to anticipate. Integrating whalers and then Greenpeace-like folks who are attempting to stop them, LaValle weaves in a social issue that’ll get you thinking. Further on, there are hints there’s more to Dr. Frankenstein’s descendants’ turmoil, which should ramp up the social/political elements further. This gives the narrative a bit more pertinent meaning than a straight monster science fiction comic. Carved out a nice throne there Frankie. That said, the integration of science fiction is well crafted and subtle enough to make it seem realistic. Dietrich Smith draws this issue and you get a sense this is the future, but not a lot has changed either. It’s a good way to convey humanity is further along, but we’re still the upright walking animals that shouldn’t be trusted with too much technology. Frankenstein’s monster has an almost corpse like look that gives him a scary yet respectable look. His long hair almost makes him look wizened and his no nonsense behavior certainly backs up his formidability. Good care and attention is spent on faces and backgrounds, which make the book feel more realistic too. The colors by Joana Lafuente are subdued, dreary, and give a sense of a more realistic but depressing sort of future. A futuristic car meanwhile, is cast in purple, which helps set it apart and make it feel special. There’s a good use of glow when it comes to the car’s navigation systems, which helps cast the main character in a somewhat magical sort of role. Overall you get a sense this is a place we may want to go to, which certainly works with the more negative nature of the books narrative. The first two pages left me a bit confused and even put off. The first page, this epic POV of Frankenstein’s monster perched on an iceberg, is over the top and somewhat unrealistic looking. He then falls down into the water and seems to be the size of a whale. Maybe it’s a calf, but it’s look is more of a whale shrunken (or just a regular sized whale). This left me confused, though cleared up in the very next page. LaValle integrates some interesting details that seem to suggest he’s furthering the Mary Shelley mythos, but putting his own spin on it too. That’s exciting, and makes this cinematic style story all the more interesting. Makes a strong case for sci-fi fans and Frankenstein fans especially.